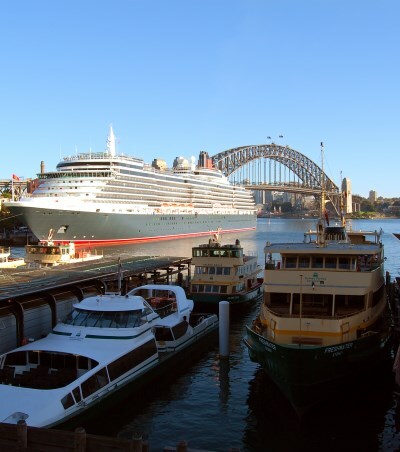 Photo: Cunard’s Queen Victoria and the Queen Elizabeth Liners passing on Sydney Harbour. Cruises coming to, visiting and leaving Australia are being added to in ever-increasing choices. You can choose from short two day trips to extended sea voyages, all with the trimmings you need for a great holiday. A dream trip for Australians would be the full circumnavigation of Australia. Stopping at all the key ports on the continent, the voyage takes in everything Australia has to offer, the best food, places to visit and things to do. When at sea, enjoy the fresh air, entertainment, reasonably priced drinks and luxury accommodation, for the price of a hotel room on land. Photo S. Oost: Thirty years on the day, the QE2 arrived in Sydney on its maiden voyage. Now, the QE2 is on its last voyage, on the way to Dubai, while the Queen Elizabeth is celebrating its Maiden Voyage. Some of the many famous ships that sail to and from the Australia continent as well as Tasmania and Norfolk Island on literally thousands of available cruises every year. There are different offers available, so check to see whats available. POCruises.com: P&O has the Pacific Dawn, based in Brisbane. Cruise round trip from Brisbane with Pacific Dawn to the South Pacific or North Queensland. Alternatively, sail from Sydney with the Pacific Jewel to Tropical North Queensland. 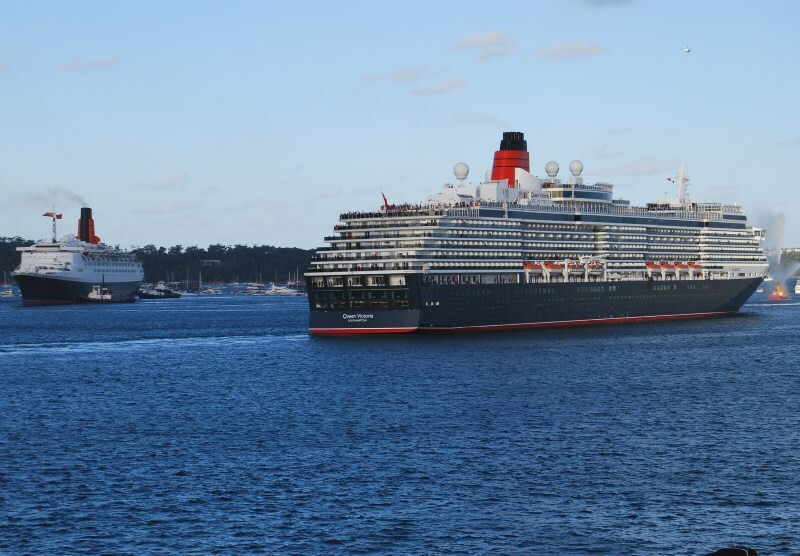 Main Photo: Cunard’s Queen Victoria and the Queen Elizabeth Liners passing on Sydney Harbour.